One intriguing aspect of the study is that it identifies two factors that explain why some molting parents do not desert; age of the dependent offspring, and age of the parent. If the offspring are older and close to the age of independence, which occurs about 35 days after hatching, a tailless molting parent may continue providing care. If the offspring are younger and more demanding, however, a molting parent nearly always deserts. Similarly, old veteran males are less likely to desert than are younger males with fewer years of previous breeding experience. 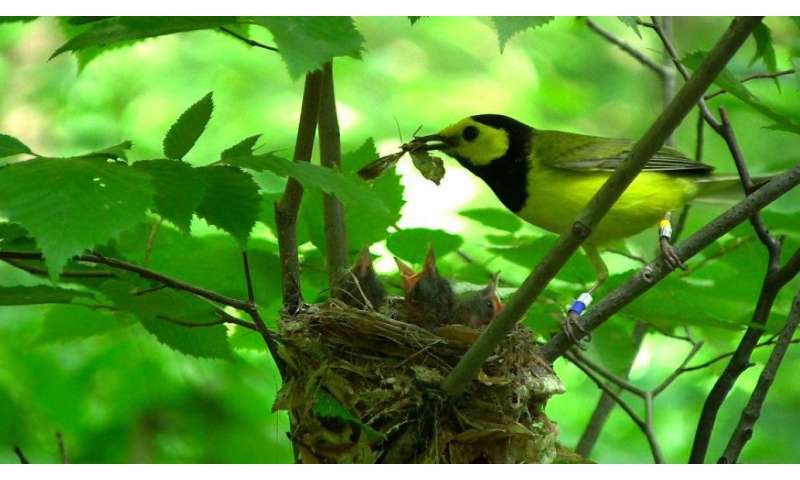 These observations indicate that Hooded Warblers are acutely sensitive to the costs of providing parental care during molt. "If the costs of continuing care are relatively modest—for example, if it's an experienced male with offspring close to independence," says Mumme, "a molting parent may elect not to desert."